PICB Omics Core was established in 2012 as a service platform. It has been enhanced and supported by PICB administration, IT and Uli Schwarz Central Laboratory. Omics Core provides both library preparation and following high throughput deep sequencing services. Basic data analyses services are also supported. Omics Core is to provide high quality next generation sequencing service not only to researchers at PICB, but also to researchers from the other institutions. 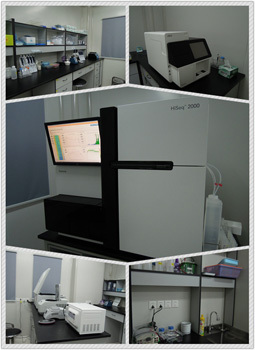 The Core has been equipped with one illumina HiSeq 2500, One NextSeq 500, cBot, Tru Temp Microheating System, High Speed Micro Plate Shaker, centrifuges, Qubit, incubator, micro oven and other auxiliary instruments. PICB Omics Core provides 1x100, 1x75, 2x75, 2x125, 2x150 sequencing run. Standard workflows are available for genome, metagenome, transcriptome, exome, small RNA, chromatin immunoprecipitation products, etc. It includes the library preparation, the sequencing and the basic bioinformatics data analysis.